We are thrilled to have won an award in the 10th Annual International Design Awards. Our design of the perimeter hoardings for our client, Science Gallery London, on the King’s College London campus, scooped a silver award in the Print-Signs, Exhibits and POP Displays category in the IDA’s 2016 round of awards. “To win an award on this project feels really good, as the project itself was a real thinker and the brief required some proper unpicking. It also completes a kind of delightful design circle: the design inspired a hakathon, in which we got involved as judges, judging the work of participating coders and designers. So, to be judged so favourably on our own work is just great – and hopefully underpins our judging credentials!” said Sherlock MD, Tony Lock. Science Gallery London (SGL) tasked us with designing a perimeter hoarding for its London Bridge site to build interest and engagement ahead of its 2018 opening. We conceived a large cyber eye as the key visual device to penetrate the crowds of passers-by, the initial spark of inspiration for which came from the Voight-Kampff machine test scene in the 1982 Sci-Fi film Blade Runner. This presented the perfect cultural reference point, as it aligned with SGL’s raison d’être as a place where science and art collide. 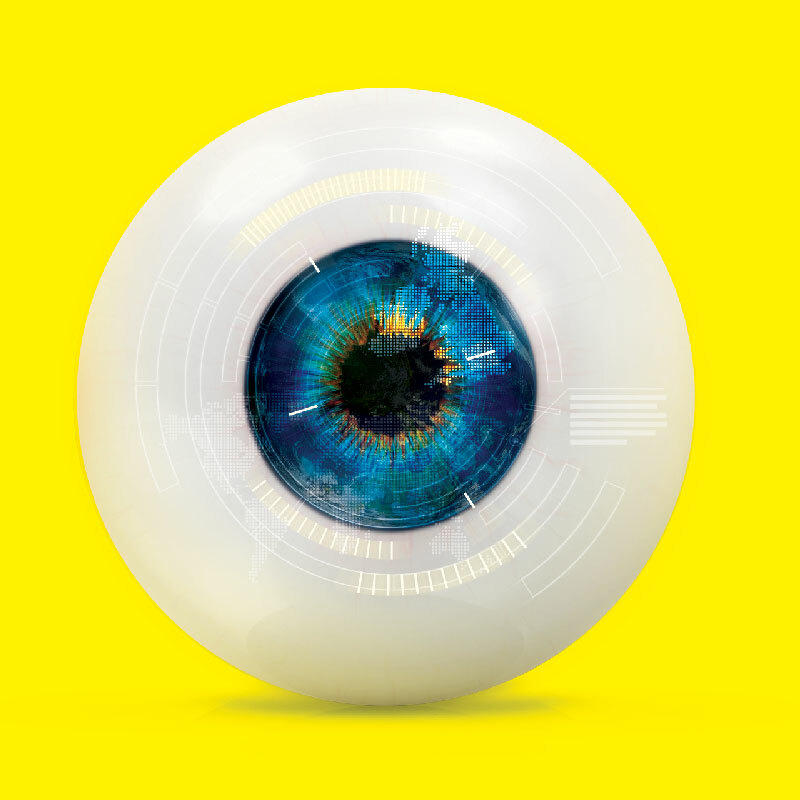 The eye’s bright yellow backdrop and its strategic positioning further enhance its impact, maximising the visual effect on crowds descending down the escalator towards the site. The eye design inspired SGL to run a hackathon (#Eyehack) inviting designers and coders to build an augmented reality ‘blip’ that could be seen by passers- by who blipped the hoardings using the Blippar image recognition app. You can visit the awards page by clicking here and read our full project case study by clicking here. The IDA says… IDA honorary juries examined over 1000 entries submitted by architects and designers of interiors, fashion, products, and graphics from 52 countries throughout the world. After final decisions had been made, the jury rewarded the best professional and emerging designers for their achievements in terms of design, creativity, usability and innovation. Judging was a rigorous process, with winners receiving publication of their work in the International Design Awards Book of Designs. The coveted IDA Trophy will be awarded to all Designer of the Year title winners at the official biennial International Design Awards Ceremony in Los Angeles. You can visit the awards website by clicking here.